Our family of 6 had a blast. This was our first time rafting and much easier than we thought. You will get wet and need to know how to paddle. Our guide Josh was very knowledgeable and we got into the river last and finished 1st! The whole process was very organized. There is a bus ride to the beginning spot and you end up at the main facility. There are lockers, concession stand and gift shop. A definite must when visiting the area. Awesome experience. Great guides. They even provided some great hiking spots to explore after our trip. Beautiful scenery down a gorgeous river. I would highly recommend this adventure on your next trip to the Smoky's! This was the best tour! The guide was excellent...this is the best in the area. George was our raft guide and he was awesome. The trip was so fun and the water is freezing so be prepared. Highly recommend. Have done this rafting trip once before about 10 years ago. Worth going had 4 with experience on white water raft and 2 new bees...worth it for all of us. Highly recommended for first timers and still a good time for us that have done this and other rivers before. Had the best guide who hit every rapids exactly perfect to give us the best ride ever. Thank You so much Kansas!! 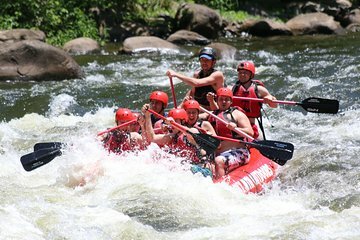 This is a great trip for kids and people trying out for rafting for the first time. Our guide Bubby was awesome and extremely knowledgable! We arrived early and they gladly bumped us to an earlier slot. The raft guide was very friendly and very talkative. Made you feel like like we were friends floating the river. The river Rapids were awesome. FUN!!!! We had Krazy Carl as our guide and he was wonderful, knew every ripple in that water. Had we had more time in our vacation, would have gone again!! Our guide, JB was awesome. We had a great time.